Well, first you check the forecast to see if it’s going to rain. Then you pray the forecast is right. Then you cut the hay. Then you wait (and pray some more). Then you rake the hay, twiddle your thumbs while it dries and you bale it all up and haul it to the barn. And it better not rain or else. If you have done everything right your livestock will eat well and the barn won’t burn down. So let’s go through that more slowly. In four-part harmony. With feeling. This may not apply where you live. Find a local mentor. 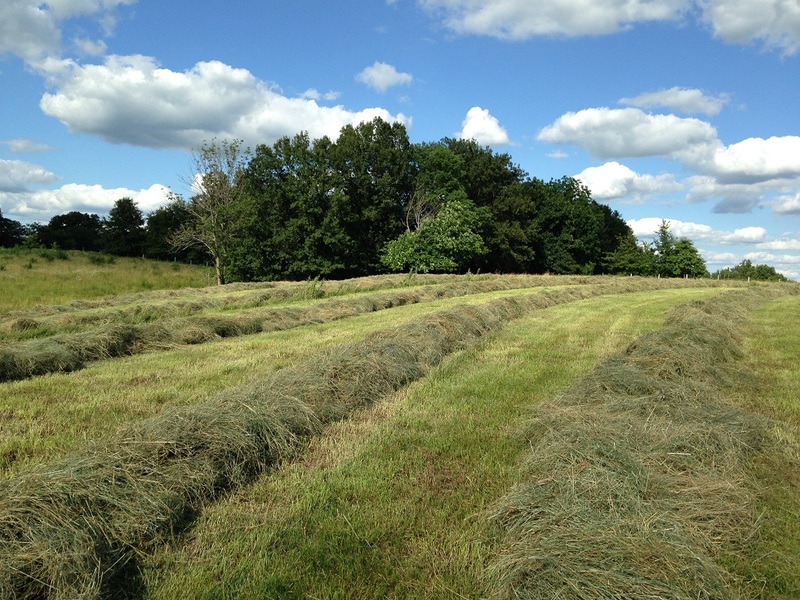 We cut hay to the east of the farm over my lunch hour one Tuesday (as we usually do). It’s better to wait till later in the day so the brix in the forage is high. Dad had me take my chainsaw to cut tree sprouts so they wouldn’t damage the hay conditioner so I was too busy to take any pictures. Imagine a machine with an array of cutter teeth cutting through the grass about 2″ high and feeding it through a crimper. The crimped grass dries out more quickly then is left laying in a wide row behind the cutter. Swallows usually follow the tractor to grab the bugs as they fly out of the grass around the mower. You down? We leave that laying for a day or three until it is dry enough to turn. 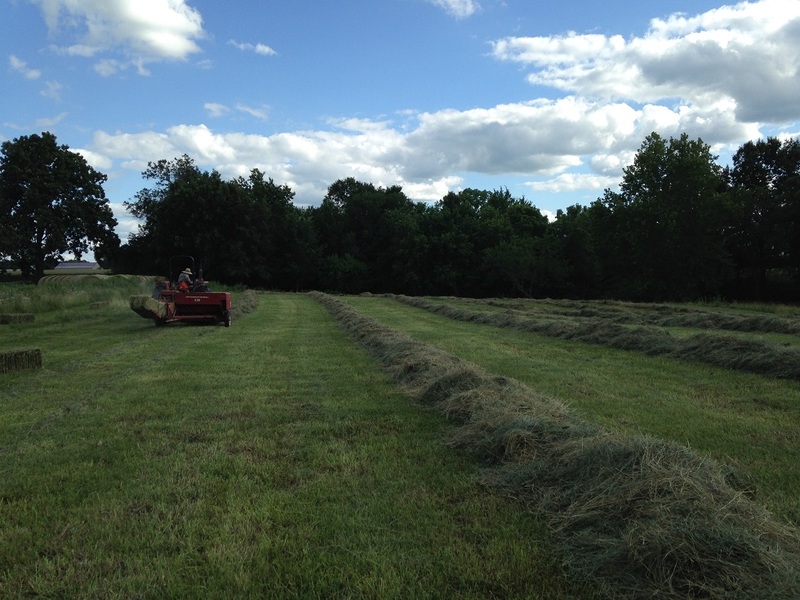 Dad likes to rake the grass hay into full-on double windrows (Whoa! Double Windrows! What does it mean?). By turning it we expose the grass that was on the ground that may not be quite dry yet. Dad makes double windrows so he can bale more slowly and have more room in the field. Maybe there are other reasons. We really don’t talk about it. In some cases the windrow is too wide for the baler so I usually keep a pitchfork with me as he bales to scoop up hay that was missed. We are always in a bit of a pinch on baling day (in this case, after work on Thursday). We have to wait for the dew to dry off of the hay before we can rake. I spend a little time digging through the windrows looking for wet spots as dad rakes. I also think it is interesting to look at the variety of forages. We raked up some thick stems, some thorny things, you can see brown, leafy clovers, grasses, some goldenrod, once in a while a little plantain…it’s all here. That variety will be a good thing in the winter but it’s hard to dry out the thick stems without damaging the finer hay. Then we have to wait for that (now) top layer to be completely dried out before we can bale it. But we have to bale it before the evening dew comes on. We have to get the bales up before they soak up moisture in the evening. There isn’t much standing around once we start and we have to be careful not to cut too much at once. This time we cut about an acre and a half. That’s enough for us. 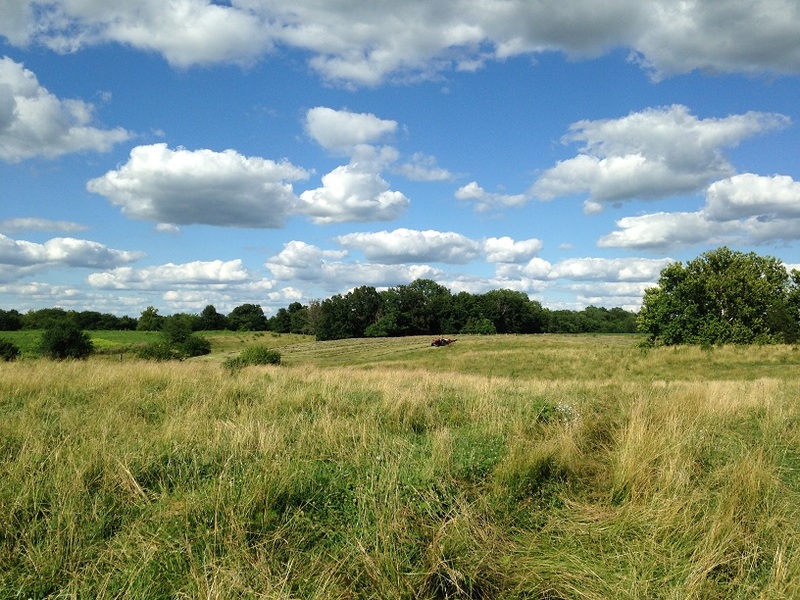 We have a 9-acre field to cut later in the summer. We’ll spread that out over several sessions when the weather looks right. Dad ties in with the baler around 4:00. He made heavy bales the first pass as the hay was thicker than we had expected. After a bale broke he backed off the bale tension and cruised through the rest of the field. Sometimes bales just break (as did two others) but that can just be because of a weakness in the twine. The first bale that broke was a monster. Just a monster! We either feed the broken bales back through the baler or I just scoop them up later with a pitchfork and a trailer. As dad bales I follow him around the field scraping up hay that the baler missed and adding it to the next windrow. My oldest son and I also try to double up the bales so we don’t have to travel so far when we come back later to pick them up. We could stack the bales right off of the baler but that makes me sneeze…lots of dust. Instead, we pulled two wagons behind the tractor. 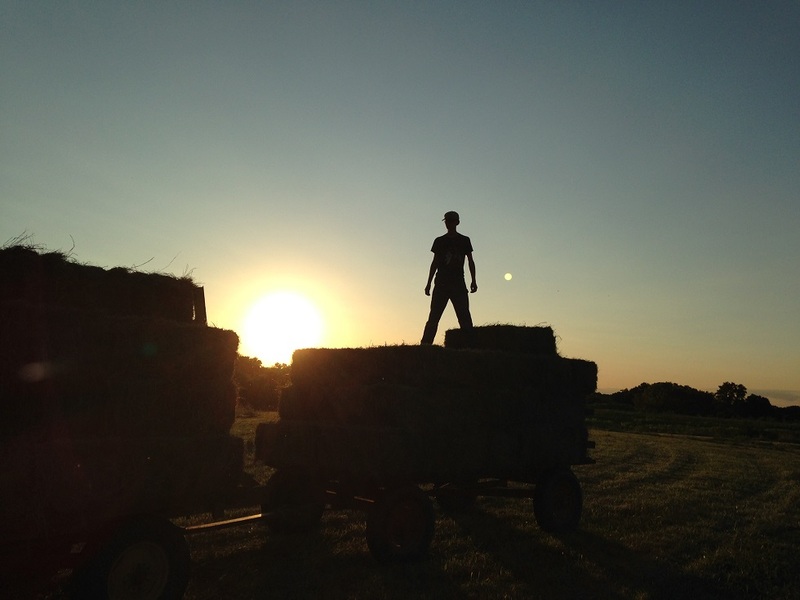 I alternated putting the bales on each wagon and the boy and the wife stacked. I suspect Julie will drive next time and dad will stack. Some of the bales were pretty heavy. It was pretty good hay. I was expecting to get 80 bales from this field. We ended up with 166. I didn’t have enough wagons for that much hay and we had to drive up and down a steep valley that prevented us from stacking high. We had to take two wagon loads to the barn so we could continue. Again, we had to get the hay off of the ground or the bales would absorb moisture. We are almost finished in the picture above and I’m breathing hard between bales. You can see how much time has passed by looking at the sun in the last two pictures. It is always a long, hard, hot day but it is so nice to smell that little dose of summer when you go to the barn in February. We normally plan to put up grass hay on Memorial Day, July 4 and Labor day but this year has been late because of all the rain. Alfalfa is on a slightly more frequent schedule. I like to spread at least one load of composted manure on the field for each wagon load of hay we remove. Usually it is a mix of brooder litter, pig bedding, horse manure, cow manure and whatever else I can scrape up topped off with a layer of crushed limestone…all loaded by hand with help from that strong young lad in the picture above. A neighbor was killed this weekend putting up hay. Be safe. I try not to cut hay on the slopes but there are any number of dangerous things I do in the field that I shouldn’t (walking between moving wagons or dismounting a moving tractor on a flat field). Dad and I have agreed to focus on safety moving forward. Great photos, I mean really great. Wish we had a tractor and sickle bar and rake and baler and wagon sometimes. Maybe I’ll wish upon a star tonight. There are about 5 folks I know cutting hay around here and none of them have time for me. In fa ct, there are lots of signs going down the road toward town “Free hay, you bale it” etc. That happen in your area? Not much hay to spare around here. A lot of hay is going south and west. All the little scraps of ground are being baled. We have been so wet the first cutting was missed or failed. 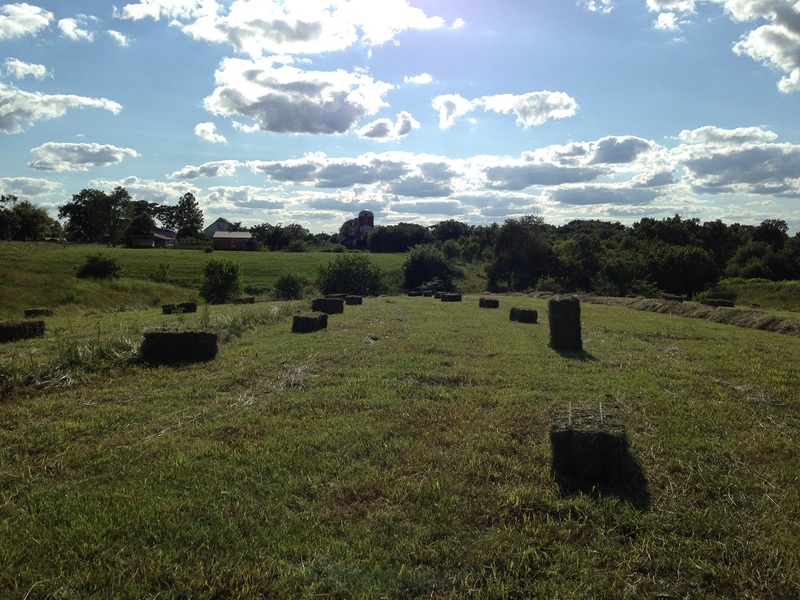 Those rows of bales you see in the moving the cows video were cut at least a month late. The alfalfa is stemmy and low quality if not wet. I don’t have high hopes for it as feed. Fortunately I shouldn’t need any of it. Maybe I’ll just use it for bedding. The alfalfa went to seed so I’ll gather nutrients and spread the seed on my pastures. I noticed those round bales in the video – so you bale both round and square AND own equipment for both? Nope. There is no way dad and I could square bale 17 acres of alfalfa on our own. A neighbor (distant cousin) agreed to round bale it for half the hay this year. I think the deal works out well for all parties involved. Dad and I will probably make a few squares later on though. So, haying time all round then. Ours just got cut yesterday, and will go pretty much as you describe except that Hay Guy will ted the hay sometime today. The locals try to ted only once, but our changeable weather means they often do it more often to speed up the drying process. Hay Guy also has automatic loaders that follow him when he’s baling, and they scoop up the bales, load them into a big stack and even unload them into his open sided pole barns at the end. You definitely want one of those! I think that would require a wire-tie baler. I should show you the mountain of old baling wire I have gathered from all over the farm. Dad was in Colorado when they were putting up hay a few years ago. He said they would bale at night. 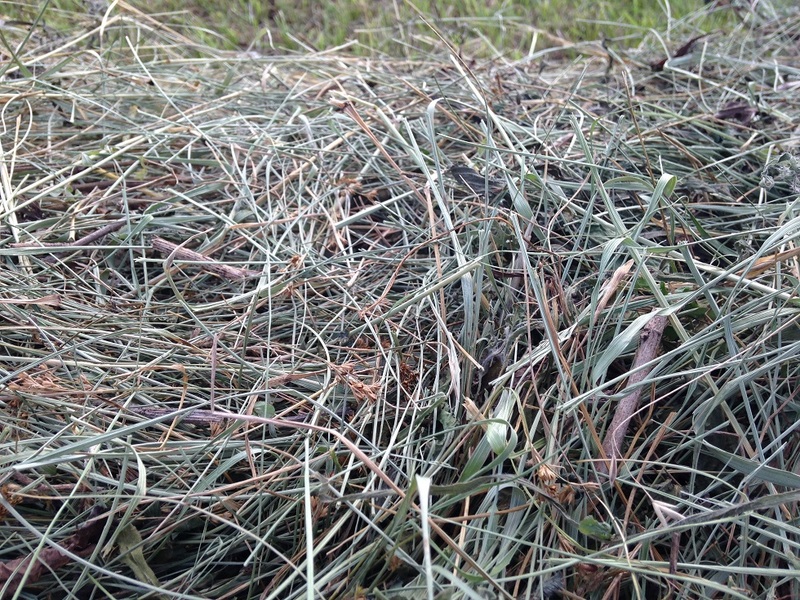 Otherwise the hay was too dry and they would lose all the leaves off of the alfalfa. Wow. too dry. Hay Guy could only dream. Nope, everyone is using plastic twine on the square bales here. The bales are smallish BTW, about 40 lbs. I’ve got my own junk shed of baling wire broken cutter teeth, old horseshoes, broken T-posts, etc. Thanks though. Yeah. I need to start hauling junk. Same here in Eastern Oregon and Washington, night baling to protect the alfalfa leaves. No such dryness here though 😦 or alfalfa for that matter. Like SSF, it’s hard to get the hay dry. We need a tedder before we buy something else. Did you cry over your double windrows like the guy did over the double rainbow or were you able to keep it together? Lol But seriously – one of your neighbors was killed haying? We are flatlanders including my hay crop so can’t imagine though you hear stories of tractors in the north country that roll on hills and horror stories of people trying to fix equipment quickly while it is running and that rarely turns out good – you are right – safety is number one!